(PORTSMOUTH, NH) June 2005- As Life Sciences Principal Advisors, MVS Solutions, Inc., has mentored and provided commercialization assistance to over 40 (forty) NIH SBIR Phase II Awardee Companies (Small Business Innovation Research Awardees) in the Larta Institute (Larta) and National Institutes of Health (NIH) Commercialization Assistance Program (CAP). 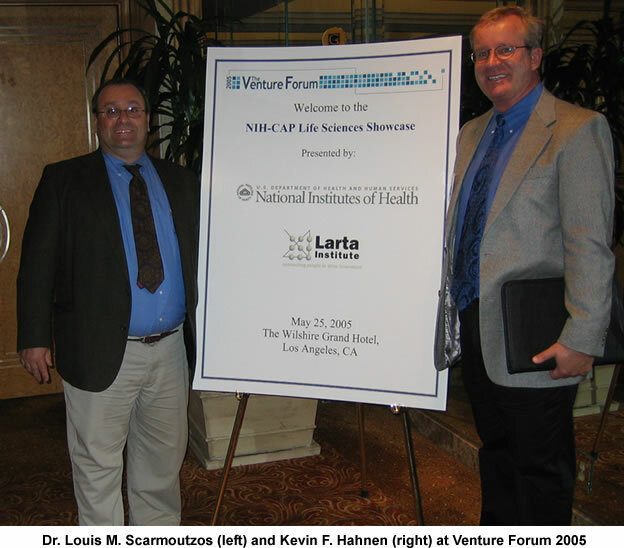 The NIH-CAP program recently culminated with companies presenting to investors at the 11th annual Venture Forum at the Wilshire Grand Hotel in Los Angeles, California. Venture Forum 2005 highlighted top-quality emerging life science companies funded by the NIH with the potential for growth and commercialization. Venture Forum 2005 featured 70 (seventy) life science companies from across the nation. These NIH funded companies networked with company CEO's, investors, and world-class experts with insight concerning emerging trends and future technology and commercialization opportunities. Information regarding corporate, technology and new enterprise development and mentoring in the biotech and life sciences industry is available from MVS Solutions Inc. by calling (617) 283-2182 or online at www.mvssolutions.com and at www.mvssolutions.biz. MVS Solutions, Inc. is a corporate and technology development company focused on the biotech, chemistry, life sciences, pharmaceutical, medical device, healthcare and related industries. The Larta Institute is a non-profit Southern California think tank for technology businesses. Further information about Larta is available at www.larta.org. The NIH is a government agency of the U.S. Department of Health and Human Services (HHS). Further information about the NIH SBIR program can be found online at http://grants1.nih.gov/grants/funding/sbir.htm Additional information about the Larta NIH-CAP program can be found at www.larta.org/nihcap/. Information regarding MVS Solutions and their products and services can be found at www.mvssolutions.com and at www.mvssolutions.biz. MVS Solutions, Inc. has offices in the Metro Boston Massachusetts and New Hampshire Area.